A comfortable writing instrument, the Allegra Ballpoint Pen comes with an ergonomic, rubber grip. Smooth quality black ink is delivered from a Parker type refill (1.0mm nib). 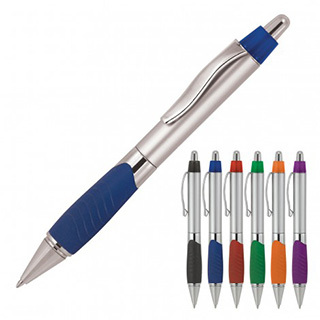 This contemporary fashion push button, retractable ballpoint promotional pen can be pad printed with your logo to the barrel to create a professional personalized gift.